Our New Orleans Segway Experience Tour is geared toward customers more interested in sightseeing beautiful New Orleans, rather than getting a full historical tour. Your Segway tour guide will lead you down New Orleans’ famous Canal Street and point out many historic theatres and shopping districts. You will visit the Mississippi Riverfront, glide past Harrah’s Casino, cruise past the Audubon Butterfly Garden, and see the Audubon Aquarium of the Americas. Our New Orleans Segway Experience Tour is geared toward customers more interested in sightseeing beautiful New Orleans, rather than getting a full historical tour. Your Segway tour guide will lead you down New Orleans’ famous Canal Street and point out many historic theatres and shopping districts. You will visit the Mississippi Riverfront, glide past Harrah’s Casino, cruise past the Audubon Butterfly Garden, and see the Audubon Aquarium of the Americas. 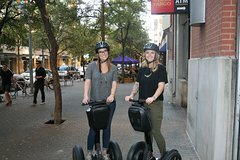 This Segway tour is a delightful way to start your day in downtown New Orleans before much of the business and tourist traffic picks up in the later part of the day.